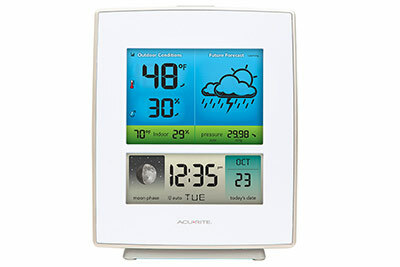 AcuRite illuminated displays that feature auto-dimming brightness feature various lighting settings, ensuring you can easily read the information you want at a glance. The displays allow you to select a brightness preference manually, or choose auto-dimming mode. In "auto-dim" mode, the display automatically adjusts its brightness based on the time of day and year, accounting for seasonal changes in sunlight.